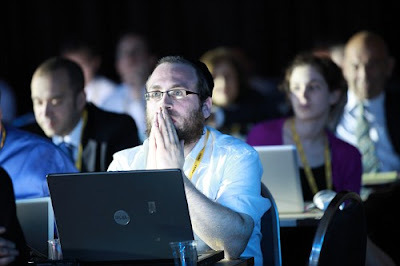 BIBIFEED - KNESSET ELECTIONS 2012-2013 COVERAGE: New Knesset. New Faces. New Hopes. Same Politics. Two weeks after the January 22 elections, the 120 members, 48 of them are new to the plenum, of Israel’s 19th Knesset were sworn in on Tuesday afternoon. The ceremony featured three songs by Singer Koby Aflalo, speeches by President Shimon Peres and Knesset veteran member, Benjamin Ben-Eliezer, who will serve as the temporary Knesset Speaker until a new government is sworn in, and the 120 Knesset members taking oath of office by swearing to uphold the laws of the State of Israel. President Peres told Knesset Members that "we are facing grave challenges which may prove to be existential threats or the gateway to new possibilities. We must examine ourselves and look to the outside, with a watchful eye. Israel is an island in a raging ocean; it must protect the lonely island, and act to calm the seas." MK Binyamin Ben-Eliezer (Labor), who was almost dead two years ago, headed the first plenum session, serving as the acting Knesset speaker. The inaugural ceremony also gave cameras an opportunity to capture Netanyahu meet his former, future rivals and future partners - Yair Lapid and Naftali Bennett. 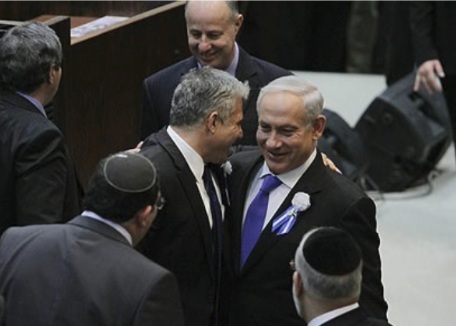 While Lapid was embraced by Netanyahu, even exchanging some brief messages, Naftali Bennett got a cold handshake while lining up for the traditional photo op.